Flame Retardant Drinks. Brominated Vegetable Oil (BVO). » About 10 percent of sodas sold in the US contain an additive called brominated vegetable oil (BVO), which has been banned in food throughout Europe and Japan. BVO is corn- or soybean oil bonded with the toxic element bromine. » BVO has been shown to bioaccumulate in human tissue and breast milk, and animal studies have found it causes reproductive and behavioral problems in large doses. » Bromines are common endocrine disruptors, and are part of the halide family, a group of elements that includes fluorine, chlorine and iodine. When ingested, bromine competes for the same receptors that are used to capture iodine. This can lead to iodine deficiency, which can have a very detrimental impact on your health. » Bromine is a central nervous system depressant, and can trigger a number of psychological symptoms such as acute paranoia and other psychotic symptoms. Bromine toxicity can also manifest as skin rashes, acne, loss of appetite, fatigue, and cardiac arrhythmias. If you live in the U.S. and drink Mountain Dew and some other citrus-flavored sodas, then you are also getting a dose of a synthetic chemical called brominated vegetable oil (BVO). BVO was first patented by chemical companies as a flame retardant. The chemical is banned in food throughout Europe and Japan. But BVO has been added to about 10 percent of sodas in North America for decades, even though it has resulted in soda-drinkers needing medical attention for skin lesions, memory loss and nerve disorders -- all symptoms of overexposure to bromine. Studies suggest that BVO can build up in human tissues, and animal studies have found it causes reproductive and behavioral problems in large doses. "Reports from an industry group helped the U.S. Food and Drug Administration establish in 1977 what it considers a safe limit for BVO in sodas. With natural alternatives already in use in other countries, why not switch in North America too?" Brominated vegetable oil (BVO) is vegetable oil, derived from corn or soy, bonded with the element bromine. It's added as an emulsifier, to prevent the flavoring from separating and floating to the surface. The FDA limits the amount of BVO allowed in fruit-flavored beverages to 15 parts per million. This is not a complete list however. All in all, about 10 percent of all sodas sold in the U.S. contain BVO, so it pays to read the list of ingredients. Better yet, make a concerted effort to eliminate soda from your diet altogether. With or without BVO, sodas contain so many ingredients harmful to your health—high fructose corn syrup being one of the foremost culprits—that they really have no redeeming value whatsoever. And please do not make the mistake of switching from regular soda to diet, as artificial sweetened drinks may be the worse of two evils. Also beware of drinks containing sodium benzoate, and Yellow Dye #5. The latter is also known as tartrazine, and has been banned in Norway, Austria and Germany due to its ill health effects. Unfortunately, according to a 2010 study by the National Cancer Institute, sodas are still the number one source of calories for teenagers between the ages of 14 to 18. Among adults, sodas and other sugary drinks are the fourth largest source of calories, according to the latest dietary statistics from the US Department of Agriculture (USDA). There's no doubt that this kind of excessive soda consumption ravages your body and robs you of good health... I believe one of the fastest ways to make a profound change in your health- and weight status is to dramatically reduce or eliminate soda from your diet, regardless of which type or brand you drink. As mentioned, when you ingest or absorb bromine, it displaces iodine. The resulting iodine deficiency can in turn lead to an increased risk for cancer of the breast, thyroid gland, ovary and prostate -- cancers that we see at alarmingly high rates today. This phenomenon is significant enough to have been given its own name: the Bromide Dominance Theory. "These findings, in conjunction with previous animal studies and with the geographical differences in the use of brominated vegetable oils as food additives, suggest that the high bromine levels found in the fat of tissues from UK children are due to the use of these compounds." "In 1997, emergency room doctors at University of California, Davis reported a patient with severe bromine intoxication from drinking two to four liters of orange soda every day. He developed headaches, fatigue, ataxia (loss of muscle coordination) and memory loss. In a 2003 case reported in Ohio, a 63-year-old man developed ulcers on his swollen hands after drinking eight liters of Red Rudy Squirt every day for several months. The man was diagnosed with bromoderma, a rare skin hypersensitivity to bromine exposure. 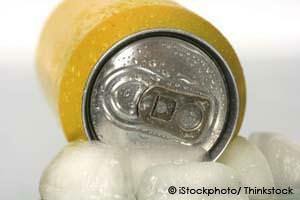 The patient quit drinking the brominated soft drink and months later recovered." Iodine is crucial for proper thyroid function. Without iodine, your thyroid gland would be completely unable to produce thyroid hormone. Even the names of the different forms of thyroid hormone reflect the number of iodine molecules attached -- T4 has four attached iodine molecules, and T3 (the biologically active form of the hormone) has three--showing what an important part iodine plays in thyroid biochemistry. Hypothyroidism is far more prevalent than once thought in the U.S. The latest estimates are that 13 million Americans have hypothyroidism, but the actual numbers are probably higher. Some experts claim that 10 to 40 percent of Americans have suboptimal thyroid function. For more in-depth information about bromine's impact on your thyroid health, please see this previous article. In the featured article, Walter Vetter, a food chemist at Germany's University of Hohenheim, suggests American soda makers could easily replace BVO with something far safer, such as hydrocolloids, which are used in many sodas sold in Europe. "They are almost exclusively natural products," Vetter says. Personally, I strongly recommend ditching all sodas, regardless of where you live or what particular additives are included, as the primary health hazard of soda consumption is tied to the excessive amounts of fructose you're ingesting. Quite simply, it's a leading contributor to the rising rates of obesity, diabetes, heart disease and other chronic diseases facing Americans. Just one can of soda per day can add as much as 15 pounds to your weight over the course of a single year, not to mention increase your risk of diabetes by 85 percent! » Dr. David Ludwig of Boston Children's Hospital did a study of the effects of sugar-sweetened drinks on obesity in children. He found that for each additional serving of a sugar-sweetened drink, both body mass index and odds of obesity increased. » The Fizzy Drink Study in Christchurch, England explored the effects on obesity when soda machines were removed from schools for one year. In the schools where the machines were removed, obesity stayed constant. In the schools where soda machines remained, obesity rates continued to rise. » In a 2009 study, 16 volunteers were fed a controlled diet including high levels of fructose. Ten weeks later, the volunteers had produced new fat cells around their hearts, livers and other digestive organs. They also showed signs of food-processing abnormalities linked to diabetes and heart disease. A second group of volunteers who were fed a similar diet, but with glucose replacing fructose, did not have these problems. Weaning yourself and your kids off the sweet stuff, and replacing it with clean, pure water can be one of the most profoundly beneficial changes you'll ever make.